Over years I’ve been enjoying comics I’ve noticed that many comic book artists get to a certain level of proficiency and “hold” there, evidently feeling that they have sufficient skills to turn out acceptable work on a continuing basis. I’ll certainly grant that drawing a 24-page comic book on a monthly schedule can be a demanding task, and is not always conducive to creative explorations and artistic growth. Some comic book artists, however, are not satisfied with “good enough” and insist on growing and changing, rising above the limitations of the monthly schedule, even if it makes them incapable of keeping up that pace. Canadian comics artist and illustrator Travis Charest (pronounced “sha-RAY”) started his career working with Jim Lee and the Homage Studios stable of artists. His early work shows the influence of the Homage style at the time, rife with over-muscled, grimacing superheros and a rendering style thick with superfluous hatching (sometimes referred to as “hay” by those who took a dim view of that inking style). Charest soon outgrew that niche style and began to exhibit the influence of comic art greats like Al Williamson, Alex Raymond and Jean Giraud (Moebius). As he matured as an artist, he kept a high level of detail and hatching, which he seems to enjoy, but he graduated from lines for their own sake to a sophisticated rendering style more reminiscent of classic pen and ink illustrators. He has done comics work and covers for Wildstorm on titles like WildC.A.T.s and for DC Comics on Flash and Darkstars, among others (checklist here). He gradually moved away from monthly comics, unsuited to the level of work and detail in his images, and began to do specials and covers, developing a detail-oriented painting style in the process. There is an Unofficial Travis Charest Art Gallery site that includes galleries and features lots of convention sketches. His “official” site seems to be a MSN discussion group, The Art of Travis Charest, which includes tutorials, news and galleries (note the gallery sub-categories in the navigation bar on the left). Also on that site is a delightful comic strip that Charest is posting to the web called Spacegirl (image above, top). Charest almost apologizes for Spacegirl, saying: “This is just a bit of fun I get to have for an hour a week, don’t take it too seriously.”, but it is among my favorite of his endeavors. Perhaps because it’s “off the cuff”, his art for Spacegirl is wonderfully loose and has a freedom not always evident in his more polished work. Plus it has an Alex Raymond meets Moebius look to it that I just love, as they are probably my two favorite comics artists. Charest left Wildstorm and made a logical move to French comics publisher HumanoÃ¯des AssociÃ©s, publishers of Metal Hurlant and home to many of Europe’s top comics artists. (The American branch is Humanoids Publishing). 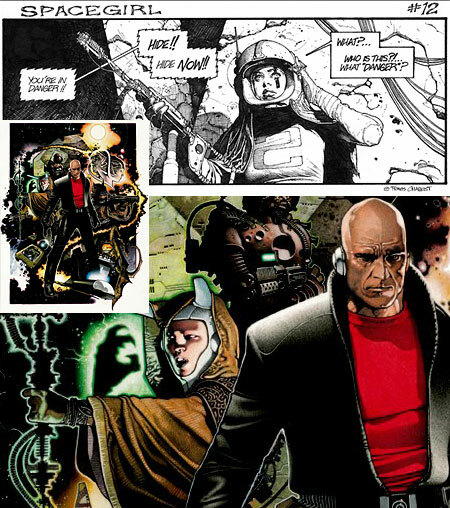 There he is currently working on a Metabarons graphic novel (promotional image: above, middle and detail, bottom) that has been a long time in development and promises to be spectacular. As always, Charest continues to push himself to new levels of accomplishment, never satisfied with “good enough”. Rob Gonsalves is fascinated with the twilight zone between worlds. The Canadian artist creates crisp, detailed acrylic paintings that walk that boundary by simultaneously representing both worlds, and the seemingly impossible connection between them, in the same image. In pursuing this he walks a shifting path himself, between the hauntingly connected juxtapositions of Magritte and the inverted logical constructs of M.C. Escher. You will see people casually refer to his work as surreal, but I think it would be more correct to use the term “Magic Realism”, simply because Surrealism relies on images from the subconscious and Gonsalves works are much closer in intention to Escher’s carefully constructed excursions into the nature of perception and thought. As you explore his work, you’ll see several themes that Gonsalves likes to return to and investigate repeatedly, much like Monet painting the same haystack multiple times. The largest group consists of the merging of worlds of differing scale, a series of elaborate variations on a theme first explored by Escher in a woodcut that is one of my favorites of his, Still Life snd Street. The other large theme is that of the blending of two worlds by similarities of repeated shape, again a favorite theme of Escher, but explored by Gonsalves in paintings that allow for the effects of color and atmosphere to carry some of the transition between the perceived realities. Gonsalves’ ability to carry off these transitions is so effective that it’s often difficult to pin down exactly where in the image your mind makes the mental shift from one point of view to the other. He explores other, smaller themes that lean more toward Magritte’s colorful collisions of realities. Among my favorites are Gonsalves’ wonderful images of what appear to be bodies of water in the distance that are revealed to be mirrored tiles in the foreground. There are two volumes of Gonsalves’ work, accompanied by lyrical text and aimed at children. One is night-themed, Imagine A Night, the other, Imagine a Day, features daylight images and has text by Sarah L. Thompson. 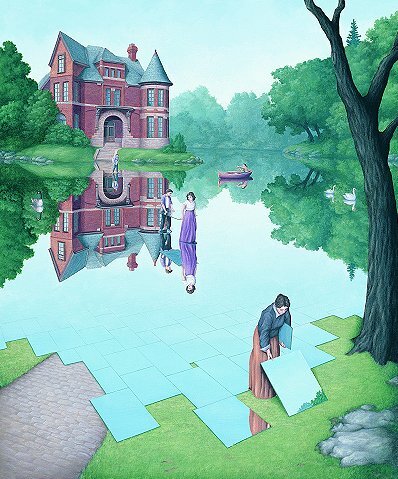 Take some time and let Rob Gonsalves walk you along that shifting path where the boundaries of “here” and “there” shimmer and change with the merest movement of an eye. Frederick Lord Leighton (not to be confused with Edmund Blair Leighton, who I profiled last week), was one of the most influential of all Victorian Academic painters. He was very much within the academic neoclassical tradition, in contrast to the painters of that time who were favored in retrospect by the 20th century art establishment, and were remembered primarily for their rejection of that tradition. For much of the 20th Century, art historians and critics considered rejection of 19th Century Academic art a badge of honor, because Academic art was the “bad”, “repressive” art from which the modern art movements “liberated” us. Leighton was closely tied to the Royal Academy, exhibited most of his major works there and was elected its president in 1878. He painted with the emphasis on draughtsmanship and elegant rendering that was fundamental to the neoclassical style, and his subject matter was mostly scenes from ancient history, mythology or the Bible. Unlike some of the weaker Academic painters who got caught up in the mere visual reconstruction of those times or subjects, Leighton was faithful to the original vision of neo-classical art and the pursuit of timeless beauty. Leighton’s early work was influenced by the Pre-Raphaelites and he shared their literary subject matter, painting scenes from Shakespeare and Dante, but he moved into more classical subjects as he travelled and was exposed to contemporary French and Italian Classical art. 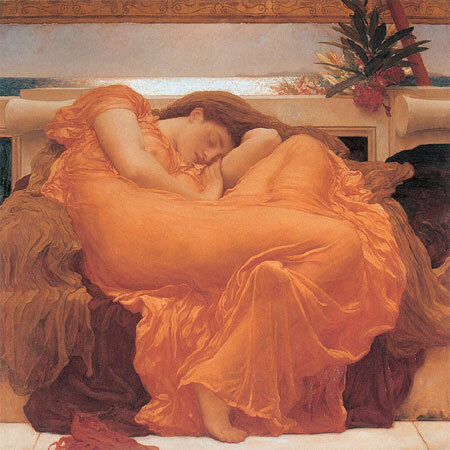 As a mature artist, Leighton was so influential among Victorian Classical painters that Edward Burne-Jones, himself one of the great figures of Victorian art, nicknamed him “Jupiter Olympus”. 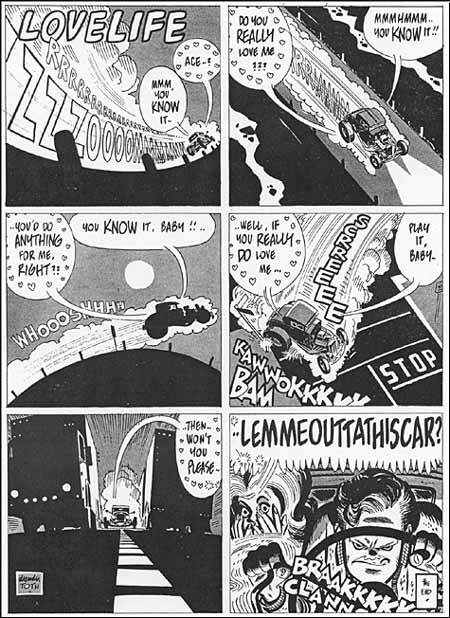 To say that Alex Toth was a master of the comics art form is perhaps an understatement. I first encountered his uniquely elegant and spare drawing style in issues of Pete Millar’s CARtoons and Drag Cartoons, drag racing and custom car oriented comics magazines in which he stood out like a Corvette in a parking lot full of Chevy sedans (image above). I then noticed his unmistakably fresh style in the pages of Warren’s Creepy and Eerie. Again, Toth shone like a midnight sun, even among the Warren magazines stable of superb comics artists. In his pursuit of capturing the essence of things with very few lines, Toth brought to bear his superior draughtsmanship and his exceptional skills as a designer. His panels are composed, elements arranged, blacks spotted, white space controlled and figures and backgrounds drawn or simply suggested with a skill that passes into the sublime. Where the majority of comics artists, even the most accomplished, would use 5 lines to describe something, Toth would do it with two. Where they would draw a detailed object, Toth would suggest with deceptively simple areas of black or halftone. His pages, particularly in black and white, were textbook examples of treating an entire comics page as a carefully designed whole, not just an arrangement of panels. Within that balanced and carefully arranged design, Toth exhibited storytelling skills, the ability to convey a story in images, that were among the best of the best. Like his drawing, his storytelling was dramatically different, unique, daringly cinematic and uncannily effective. Toth originally wanted to do newspaper comics, but adventure comics were fading from the newspaper pages when he started his career, so he switched to comic books. He carried on the artistic tradition of newspaper comics greats like Milton Caniff and Noel Sickles, however, and was the main artist to bring that dramatic chiariscuro style to comic books, where it has been continued and championed by artists like Frank Miller. Toth was also a terrific character designer and left his mark on the beautifully simplified characters for Space Ghost, Johnny Quest and the DC Comics series Super Friends. Here is an excellent gallery of his work presented in black and white, from scans of the original art on the Comicartville site. There is a multi-volume series of books on The Art of Alex Toth from Auad Publishing (where you will also find a Toth gallery), and you should still be able to find the Image Comics collection of his work on the comic book adaptation of the Zorro television show. This post on Toth has been on the back burner for a while now. When I can, I like to let the posts on the artists who are at the very top of their artform simmer a while, in case I think of something else good to say; but I brought this post forward and finished it because Alex Toth died yesterday (May 27, 2006) at the age of 77. In what is probably as fitting a way to go as any artist could hope for, Alex Toth literally died at his drawing table. John Constable, who is considered, along with J.W.M. Turner, to be the greatest of English landscape artists, made a decision midway through his career to move his landscape painting to a grand scale and began a series of large canvasses measuring approximately 6ft by 4ft (130cm x 188cm). The “six-footers”, as they came to be known, are among the most famous landscape paintings in the history of English painting. 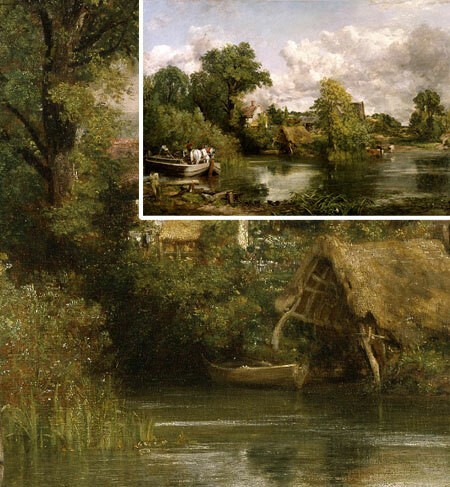 Depicting the English countryside along the river Stour, these large paintings were not only remarkable for their scale, but also for the full-size preliminary oil sketches Constable did for them. The sketches were open and painterly, with quick, distinctive brushstrokes that in some ways foreshadowed painting styles that were to follow much later. From June 1 to August 28 of this year, The Tate Britain brings this series of paintings together for the first time, and also displays them in conjunction with many of his equally large scale preliminary sketches for them. The image above, The White Horse, is from the Frick Collection in New York. The Frick’s site has a zoomable version of the image. The full-size oil sketch for this works hangs in the National Gallery of Art in Washington. There are detail images here. Take a look at the oil sketch, particularly in the details, and see what your “impression” of it is. Link via Art Knowledge News. Any of you who are familiar with Dover Books, know what a great resource they can be of public domain images from previous centuries, particularly from the 19th century when thousands of engravings were published for novels, texts, catalogs and periodicals. 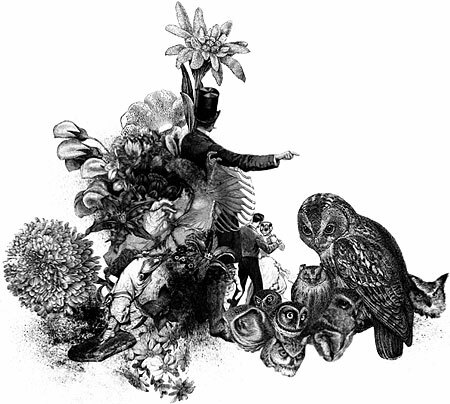 Many artists have used the Dover collections of these images as reference. Other artists have made more direct use of them to make new art. Artist Caleb Johnston has taken a number of these examples of 19th century publishing technology and put them together in a 20th/21st century publishing technology, namely a Flash interactive, and produced a work in which these detailed engravings of people, plants, animals, anatomical diagrams and decorative letterforms animate, morph, and dissolve into one another in novel ways. The module is interactive in that it depends on you move your mouse around to find “hot spots” within each image tableaux, and click on them to trigger animated sequences. Click, or re-click, on enough of them in a given image and you will trigger a progression to the next collage in the sequence. The piece is nicely done although it does require a bit of perseverance to get some of the screens to “complete” and move on to the next one. NFCTD is a wonderful diversion reminiscent of a cross between Max Earnst’s classic Surrealist collage-novel Une Semaine du Bonté, from the early 20th century, and the famous Nose Pilot Flash amusement that has been popular on the web for the last 8 or nine years. It presents an interesting juxtaposition of images, times, technologies and artistic visions.